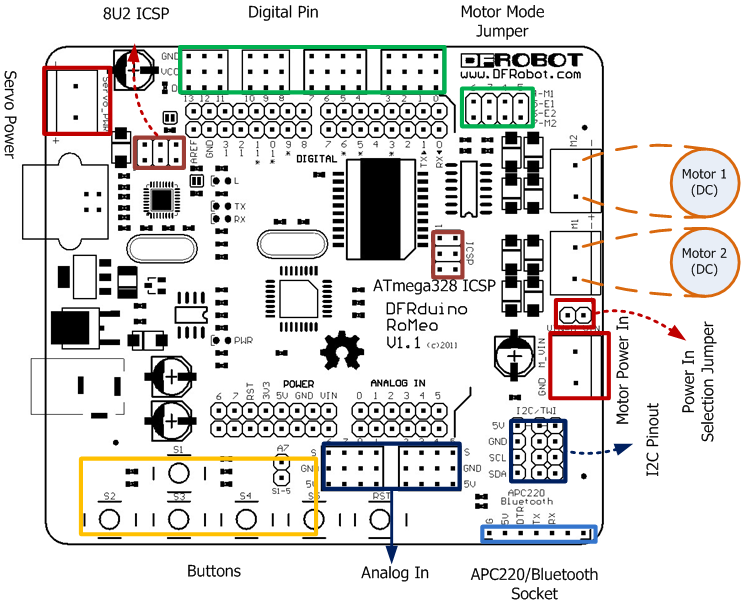 RoMeo (an Arduino Robot Control Board) is an All-in-One microcontroller especially designed for robotics application. Benefit from Arduino open source platform, it is supported by thousands of open source codes, and can be easily expanded with most Arduino Shields. The integrated 2 way DC motor driver and wireless socket gives a much easier way to start your robotic project. A. Please read this manual carefully before applying power on the device. B. Do not use this device for military or medical purpose as they are not designed to. This is one of the most important steps in getting the Romeo up and communicating with your host controller. You MUST make sure that you apply power to the Power Terminal using the correct polarity. Reverse Polarity will damage the Romeo. We are not responsible for such damage, nor do we warranty against such damage. Make sure you take time to apply power correctly. Otherwise, it could get costly for you! Power from USB: Simply plug USB cable, and the Romeo is able to work. Please notice that the USB can only supply 500 mA current. It should be able to meet the most requirements for LED lit application. However it is not enough to power DC motors or servo. 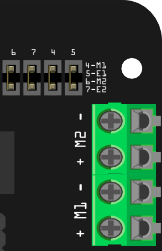 Power from Motor Power Input: Simply connect the ground wire from your supply to the screw terminal labeled “GND”, and then connect the positive wire from your supply to the screw terminal labeled “VIN". NOTE: Maximum supply voltage cannot exceed 14V DC. RoMeo can be programmed by Arduino IDE 0022 and above. It can be downloaded at Arduino.cc, Please select “Arduino UNO” as the hardware. As most servos draw more current than the USB power source can supply. A separate servo power terminal is provided to power the servo individually. This option can be Enabled/Disabled by the Servo Power Select Jumper. When the Servo Power Select Jumper is applied, the servo is powered by internal 5V. When the Servo Power Select Jumper is not applied, the servo is powered by external power source. The Romeo V1.0 uses an automatic switcher for the power source selection. When the external power source has been applied, the servo will be automatically powered by the external power instead of USB power. Applying the Motor Control Pin Jumpers will allocate Pin 5,6,7,8 for motor control. Removing the jumpers will release the above Pins, and the motor controller will be disabled. Connect four motor wires to Motor Terminal. And apply power through motor power terminal (Figure 4). The PWM DC motor control is implemented by manipulating two digital IO pins and two PWM pins. As illustrated in the diagram above (Figure 5), Pin 4,7 (7,8 for old Romeo version) are motor direction control pins, Pin 5,6 (6,9 for old Romeo version) are motor speed control pins. For previous Romeo board, the pins used to control the motor is Pin 7,8 (Direction), Pin 6,9 (Speed). You can find the information at the right side of the Motor Control Pin Jumpers. ///For previous Romeo, please use these pins. The Romeo also supports PLLPhase locked loop control mode. 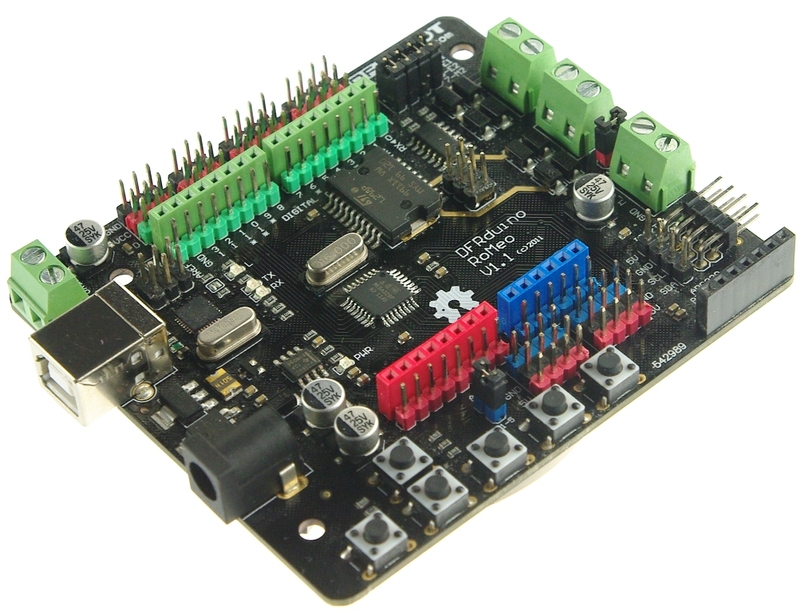 Get Romeo-All in one Controller (Arduino Compatible Atmega 328) (SKU:DFR0004) from DFRobot Store or DFRobot Distributor.